Attribute transformation in SAP IBP is a power feature which can be brought in use for various business purposes like Product Substitution, Realignment, Location Shutdown, YoY Comparison etc. We have seen the standard example provided in our SAP Help for attribute transformation which transforms the period attribute to offset Actuals Qty by 12 months.Also a blog which has been written long back by one of the community member. In current S&OP world, we always emphasize on Product Review phase to measure the performance of our products. Some time we have to take decisions to discontinue some products and introduce a new product. All those new product introduction (Phase in) and removal of the product from the planning (Phase Out) is supported by IBP Demand.In this blog, I will be taking another simple example to show how the stock quantities of one product which has to be phased out can be transformed to another product (which is substitute) using attribute transformation. In this example I have created a new master data type “Material” which consists of two attribute “MATID” (Key , Data Type : INTEGER ) and “MATDESC”(Data Type : NVARCHAR). Location master data type is same as standard. Now based on company S&OP Meeting , Product Review , they decide to substitute the Material 100 by a new Material 101. So there is a need to transfer all the old inventories of the Material 100 to Material 101 on all locations. For Attribute transformation we need a new planning level on which we define the calculation rules for attributes. Create a new planning level PERMATLOCNEW as a copy of PERMATLOC. The above transformation will transfer the values of “INVENTORY2” for Material 100 to Material 101. As per this all the stock values of Material 100 will be transferred to Material 101 at respective locations. 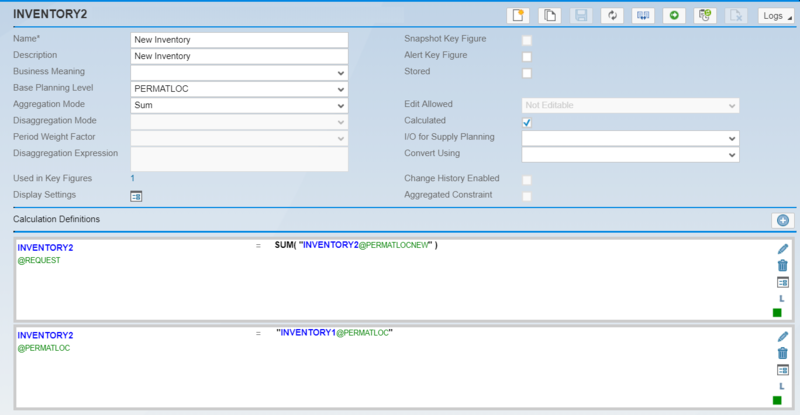 Since we have decided to discontinue with the material 100 , we can create a group operator which in first step copies the value of INVENTORY2 to INVENTORY1 for Material 101 and in second step clears the value of INVENTORY1 for Material 100. Please note that we can also do partial transfer if we define the calculation rule in INVENTORY2@PERMATLOC = INVENTORY1@PERMATLOC * Copy Factor. This was a just a simple example as to how to approach this topic and how we can use the power of attribute transformation to simplify some critical business problems. Hope I could explore a bit on this topic. I really want more and more use cases to be explored under this umbrella. PS : The same example can’t be used as it is because of difference in planning levels,attributes and KFs used but the concept remains same.